The 2002 Common Fisheries Policy (cfp) reform introduced the Regional Advisory Councils (rac s) to enhance stakeholder involvement and correct one of the policy’s primary deficiencies, its lack of legitimacy, arising in part from low stakeholder involvement. While some criticize the 2002 reform as not going far enough to alleviate problems of lagging process and content legitimacy, in certain ways the rac s may be thought of as representing an interim institutional stage, facilitating better information sharing and cultivating stakeholder relationships. Based on a survey of rac participants, this paper illuminates the current capacities and functions of the rac s. The paper reveals that the rac s possess additional—often not sufficiently recognised—roles and values to the advice they produce as they facilitate understanding across and within sectors and interest groups and act as key purveyors of information. Additionally, the findings indicate that among those participating in the rac s, there are varying degrees of feelings of impact. Some participants recognize a positive change in EU fisheries governance, whereas others are sceptical of purported improvements. The 2002 Common Fisheries Policy (cfp) reform introduced a novel set of stakeholder bodies, the Regional Advisory Councils (rac s), to provide advice primarily to the Commission of the European Communities (Commission) on matters pertaining to the fisheries in a defined geographic area or related to specific fisheries. Following the principles of good governance, which emphasise the importance of public or user group participation in policy-making, the European Union (eu) attempted to address the cfp’s poor record of low process and content legitimacya by utilising the strong link between stakeholder participation and legitimacy, understood as an internalized obligation to comply with rules (Raakjær Nielsen 2003). Nonetheless, soon after the 2002 cfp reform was in place, questions regarding the actual extent of the stakeholder involvement in European-level fisheries management continued to arise. For a more thorough introduction to the governance system of the cfp and its current challenges—not least in terms of legitimacy—please refer to Symes (2012) or Hegland et al. (2012a) earlier in this special issue. Presently, the rac s manifest an intermediary institutional level between the central eu and member state levels oriented toward particular marine regions (and specific fisheries). rac membership comprises fishing industry and non-industry stakeholders from the eu member states who share stocks, habitats, and interests in the defined region. With another decadal cfp reform in the making, a question is whether the rac s have delivered what their architects had hoped or if indeed they merely represent relatively weak institutional structures with the weight of power remaining in the central eu entities. For perspective from those involved, it befits an investigation of the rac s’ current capacities and their memberships’ opinions on their functioning. Gray and Hatchard (2003), as one example, contend soon after the 2002 reform that the Commission’s statements related to reform and surrounding discourse exceeded the detectable change attributed to the policy. The central criticism laid against the role of the rac s is that stakeholder input is restricted to the pre-decision phase while the EU central level retains its decision-making authority and only to a limited extent commits itself to take into consideration advice received (Gray and Hatchard 2003). The authors are blunt with their criticism: ‘All these reservations and restrictions seriously question the Commission’s commitment to the principle of participation as a right or entitlement of stakeholders’ (Gray and Hatchard 2003: 548). Nonetheless, co-management, defined as a sharing of management between users or stakeholders and state authority, adopts various forms ranging in levels of informative participation to devolved authority (Sen and RaakjærNielsen 1996; Hegland et al. 2012a). Moreover, literature points to other benefits of forums whose sole purpose centres on soliciting comments and opinions from the constituency (Halvorsen 2003; Chase et al. 2004). Interactions between different stakeholder groups often afforded in such settings benefit both process and content legitimacy. In the first instance, stakeholders put a face to a divergent opinion and in ‘high quality processes’ a developed rapport may ease arguments on contentious issues and initiate solutions (Halvorsen 2003; Dalton 2006). Related to improved content legitimacy, exposure to other viewpoints fosters understanding of agency or ministerial decisions and compromises that are often necessary in policy areas like fisheries management (Halvorsen 2003). Furthermore, in cases where stakeholders feel satisfied with the facilitation of the participation process, good will toward the convening entity or governmental body can manifest as confidence in the agency’s abilities to handle other policy matters and make decisions (Halvorsen 2003). The question as to what constitutes a successful participatory process—be it related to user groups, wider stakeholders, or the general public—has received great attention over the past decade. Dalton (2005) outlines active participant involvement, complete information exchange, fair decision-making, efficient administration, and positive participant interactions as the five foci in a framework related to high quality participation in Marine Protected Areas. In an assessment of existing theoretical and empirical work on participation processes in natural resource management, two central conditions emerge: a) learning and gaining information via participation; and b) granting some decision-making power to participants. So, the question here is, has the absence of decision-making authority undermined the value of the rac s? Holding to the issue of decision-making authority, Gray and Hatchard (2003) argue that the Commission’s stated interest in increased compliance through stakeholder input is undercut by keeping the rac s consultative in nature. However, this criticism from 2003 may undervalue the evolutionary aspect of institutional reform and neglect the need to build institutional capacity. In fisheries the gradual development of stakeholder forums often improves the management system as the slow pace affords time for collective learning and information sharing leading to more successful stakeholder participation forums (Hanna 1995). Additionally, public participation literature asserts that those involved in processes become better informed over time (Chase et al. 2004), which adds to this notion of building capacity. Admittedly, Gray and Hatchard (2003) do point to such benefits as they conclude that the 2002 reform did improve communication between the Commission and eu fisheries stakeholders. The data presented in this paper is drawn from the results of a survey of rac meeting participants. The survey employed an online questionnaire with e-mail invitations, followed up by a traditional, mailed questionnaire to those who had not completed the online version. Survey participants were solicited for this study between February and April 2010. The survey data yield comparisons between the priorities and challenges of four rac s, the North Sea, North Western Waters (nww), South Western Waters (sww) and Pelagic rac s. Among the rac s included, the Pelagic rac faces unique circumstances in comparison to the other three because of the migratory nature of pelagic stocks and resulting quota sharing with non-eu countries. As a consequence of the survey coverage, the data obtained do not illuminate the specific preferences of the Baltic, Mediterranean, and Long Distance rac s; yet the overarching themes and problems associated with the cfp likely apply to these as well. Due to the diversity of the population, respondents had the option to access the survey in English, French, Spanish, or Portuguese. We defined the population as those who attended a General Assembly, Executive Committee, or first instance of a Working Group meeting in one of the four covered rac s in 2009; the survey population totalled 329 potential participants. Unlike other assessments of the rac s—including one completed by the Commission itself (Commission 2008), which reviewed the rac s through their seven secretariats—this research directly contacted individual participants rather than soliciting an aggregated report from each rac. In total, 138 observations were obtained: 100 participants completed an online questionnaire, 30 completed a paper version, and eight partially responded online providing enough answers to merit inclusion.b The response rate for the survey stands at 41.9 per cent (138/329). Participants ranged in age from 23 to 78 years with both arithmetic mean and median coming to 46 years. The survey participants included 100 men and 38 women. For a complete description of the methodology please refer to Raakjær et al. (2010). Arguably, the rac s are in the early stages of development as the longest standing of these forums (North Sea) marked seven years in November 2011. At this juncture, policymakers and eu fisheries stakeholders have little comprehensive knowledge of who actually attends rac meetings. Therefore, this section seeks to provide a profile of who attends these meetings and illuminate patterns or discrepancies in rac participation. While compiling the survey population it was clear that a portion attend meetings in more than one rac. In the interest of making inter-rac comparisons, participants were consequently asked to indicate which rac they were most involved with (primary rac). 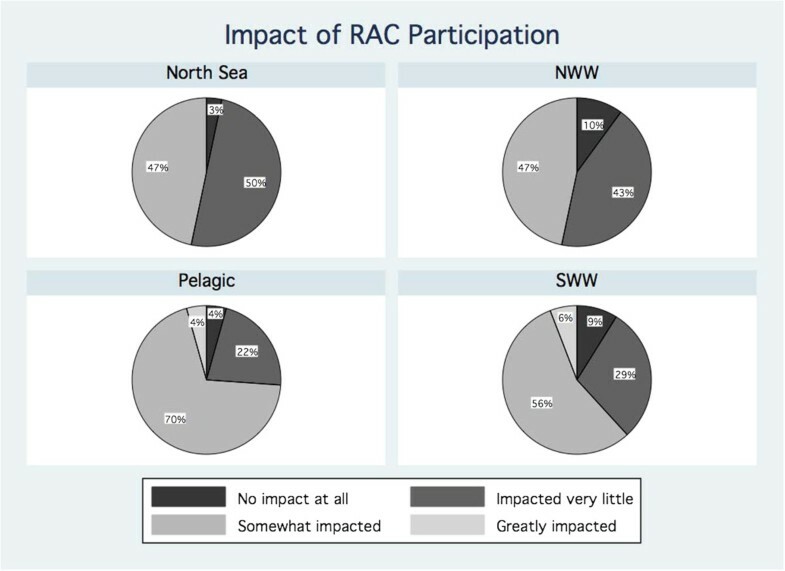 The survey garnered a relatively even distribution of the four rac s under investigation: sww (39), North Sea (37), nww (32), and Pelagic (28).d The designated primary rac provided a means of comparison to analyse the patterns of opinions and perceptions pertaining to the rac performance. For the most part, survey respondents demonstrated a great deal of experience with the issue of fisheries. In terms of experience, about twenty per cent of participants fell into each of the following categories: 11–20 years, 21–30 years, and greater than 30 years. Twenty-nine per cent had 2–10 years of experience with seven per cent working on issues related to fisheries for less than two years. Industry stakeholders form a strong presence in rac meeting attendance with nearly half the survey participants indicating their affiliation with this category (Figure 1). The survey provided fifteen different participant categories based on those mentioned in the Council of the European Union (Council) decision, which forms the legal foundation of the rac s (Council 2004). In Figure 1 and in this paper generally, we have grouped some of the original categories. Industry includes both catching and processing sectors. Organisations related to recreational fishing, women in fishing, regional development, and those who selected the ‘Multiple Interests’ option were combined into the Multiple Interests category. 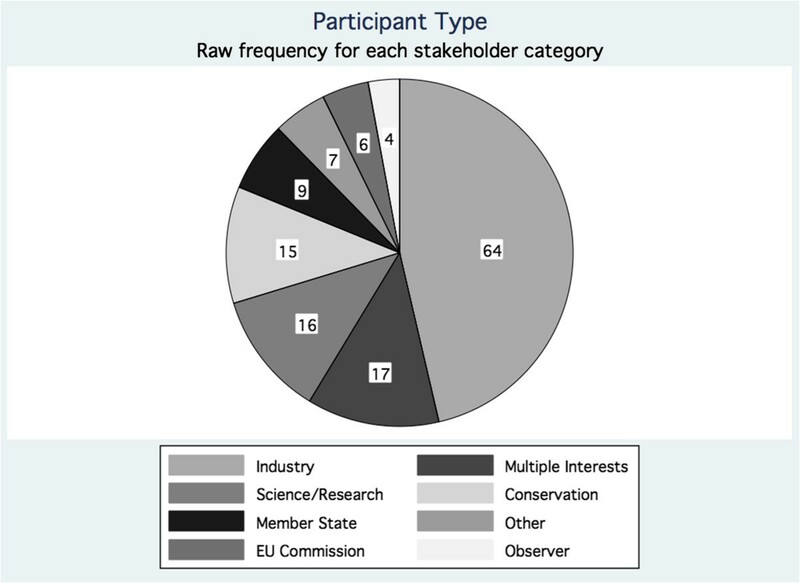 Furthermore, Conservation, primarily populated by those working for environmental non-governmental organisations (ngo s), were left separate from Multiple Interests stakeholders because, although many in the Multiple Interests category are not explicitly industry related, those groups are nevertheless tangentially linked to extractive interests.e The breakdown by participant type for each rac is included in Figure 2 beneath. Despite the Commission’s explicit intention to include aquaculture interests and consumers in the rac s, none of the survey respondents selected these categories indicating that these groups are not represented to any significant degree, either due to lack of interest or because outreach efforts have been insufficient. Share of survey respondents’ stakeholder categorisation (all rac s combined) (N = 138). Frequency distribution of participants within the self-designated rac (N = 136). Combining the number of Multiple Interests with Conservation respondents, the survey’s response population approaches the two-thirds/one-third ratio of industry to other interests mandated by the eu policy for the rac s (Council 2004), which reflects positively on the representativeness of the survey respondents. Although there is some variation in the interest composition of participants by rac, Industry stakeholders take the largest share of respondents in all four rac s (Figure 2). Notably, the Pelagic rac has no respondents under Multiple Interests and the smallest share of Conservation representatives. 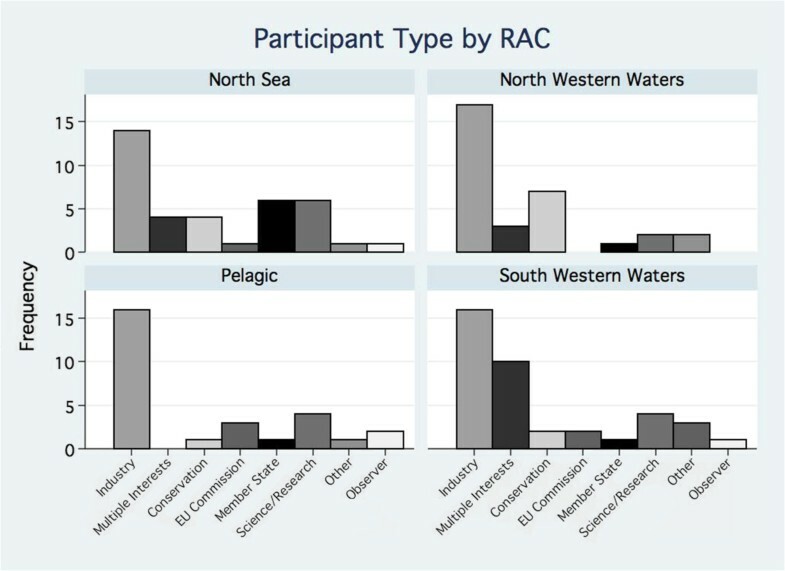 Meanwhile, Multiple Interests stakeholders are more heavily represented in the sww rac than in the other rac s.
In terms of national affiliation (Table 1 beneath), the highest percentage of respondents came from France and Spain, which reflects the prevalence and importance of fishing in those countries. Additionally, France borders all four of the rac areas considered, which may also have bolstered the number of French participants. The number of respondents from Denmark and Scotland, both totalling 8.8 per cent (of the 137 who responded to question), also mimics the relatively larger share of fisheries interests there. Respondents who specifically wrote Scotland populated their own category and are not included in the total of United Kingdom participants; those who simply wrote United Kingdom comprise their own separate category. When combined with Scotland, the United Kingdom amounts to 17.5 per cent of observations. In addition, rac participants cover a range of countries, some of which are not members of the eu, but that still have people attending meetings as observers, scientists, or other experts. The number of observations for each individual country was too low to allow for comparison among countries; however, the country of affiliation was used to define a North–south variable. South comprises France, Portugal, and Spain with the remaining countries of Belgium, Denmark, Germany, Ireland, the Netherlands, Scotland, and the United Kingdom populating the North category. Those who designated ‘Europe’ or ‘International’ as their geographic affiliation combined with Poland,f Norway and the Faroe Islands to form an Other grouping, which due to its diversity is generally not included in the analyses related to geographical affiliation. While there is a clear mandate for the rac s’ existence and their legal foundation, meeting attendants also join these forums for reasons apart from the purpose of providing stakeholder advice. Because many groups of participants total less than ten respondents, the analysis focuses on Industry, Multiple Interests, and Conservation. In the survey we asked respondents to rank various potential motivations on a scale from 1 to 5, with 5 equating ‘Very important’ (Table 2). (Table shows means with associated N in parentheses on the right. 5 equals ‘Very important’, 1 equals ‘Not important at all’). aIncluding the ‘Not applicable’ option, the mean for all participants equals 3.92 with 135 observations. Thus, participants who did not view their role as representing the views of a constituency are not included in the table. bOne Conservation participant selected ‘Not applicable’ on the ‘Serve those I represent in my organisation’ measure, but as previously noted this is not included in the associated mean. Notably, all six of the motivations presented in the survey are associated with greater than what we consider neutral levels of importance (score 3). ‘Improve stakeholder advice in the eu’, ‘Network with other stakeholders’, and ‘Serve those I represent in my organisation’g prove to be well-established motivations for participation. The priority placed on these reasons is echoed in the three primary stakeholder groups: Industry, Multiple Interests, and Conservation. There is, however, a significant difference between the motivations ranking third (‘Network with other stakeholders’) and fourth (‘Communicate directly with Commission representatives’)h indicating a split of primary and secondary motivations. Nonetheless, as mentioned, the bottom-ranked three motivations, ‘Communicate directly with Commission representatives’, ‘Interact with scientists who provide fisheries advice’, and ‘Observe’ still measure above medium importance. For Industry participants improving stakeholder advice and serving an associated constituency were the main motivations with a slightly lower emphasis on networking. There is a statistical difference between Industry’s motivations to improve advice and network with other stakeholders,i but serving the constituency yields no difference between either the first or third motivations. Multiple Interests participants view ‘Serve those I represent in my organisation’ as a very important motivation for participation. Multiple Interest respondents rate this measure statistically higher than Industry j and Conservation k counterparts. The Conservation representatives also fall in line with Industry and Multiple Interest participants in that they place particular emphasis on improving advice and networking; however, as aforementioned, there is less emphasis placed on serving a constituency. Supplementing the statistical findings of the survey, comments left by some respondents underscore that participation in rac meetings helps stakeholders stay up-to-date on happenings in fisheries management and the perspectives of fellow participants. Additionally, respondents indicated that the rac s are unique and novel entities in the eu fisheries policy-making structure; engaging in them is therefore interesting in itself. As alluded to in the discussion on motivations, the rac s have proven to be an asset to stakeholders not only as advice forums, but also through the increased collection of and access to information. In the first question survey participants chose two responses from a fixed list of information sources related to the impacts and implementation of eu fisheries management. Figure 3 beneath summarises these findings of primary information sources for each rac, which illustrates the strong preference for the rac as an information source, in particular for those in the North Sea, Pelagic and sww rac s. The nww rac displays a slightly different pattern with a stronger preference for ‘Information from industry groups and associations’ as well as ‘Other’ sources; however, information from the rac still plays a relatively important role. Top information sources by rac (N = 136. Respondents were free to choose two answers from the list). When subsequently asked in a second question about which specific rac information sources participants employ, written communication from the rac proves to be the most popular. Participants also rely more on industry representatives for information as opposed to non-industry counterparts; however, stakeholder type has some bearing on these findings as discussed below. Notably, very few participants do not consult rac materials at all. There may not be as much information seeking and sharing across organisational lines, however. Industry, Multiple Interests, and Conservation participants differ slightly in the sources of information that they seek. Likely the preference for information from Industry representatives in the overall question (Figure 3) and the rac-specific question can be attributed to the preponderance of Industry participants in the survey. Industry respondents are less likely to seek information from ngo s and other non-industry groups, as only three per cent often consult such sources based on the first question on information sources in general, and only 11 per cent of the Industry category seek information from non-industry representatives based on the second, rac-specific follow-up question. In comparison, 47 per cent of Conservation respondents consult ngo sources (overall question) and 33 per cent seek non-industry rac representatives’ information (rac specific question). Nevertheless, Conservation respondents still consult industry groups and associations, as 33 per cent of this group select the category in the overall question and 47 per cent of the Conservation category consult industry representatives of the rac for information (rac-specific question). Finally and importantly, rac meeting participants themselves see the establishment of the rac s as a boon to information access (Table 3). The vast majority of those surveyed say when asked that the rac ‘Somewhat improved’ or ‘Greatly improved’ access to information with 41 per cent electing the latter. While the survey included the option to select ‘no improvement at all,’ no participants chose this response and only a small minority felt as though the rac has only slightly improved information access. (N = 127. No respondents chose the fourth answer choice: ‘No improvement at all’). The impression that the rac s have claimed a noteworthy role in information sharing is further established in the Commission’s review, which encourages more development in the area (Commission 2008). (Table shows means with N in parentheses. 5 equals ‘Always available’, 1 equals ‘Never available’). "The rac was formed out of desire to work together to reach common objectives. The Commission supports these objectives but denies the rac the necessary resources to achieve them. Knowledge and expertise are costly but necessary and the rac does well with the limited finance but could do so much better if properly funded (Survey participant 56)." The low scores for economic and social science expertise resonate with a suggestion in the Commission’s review to expand the notion of scientists necessary to support the rac s to incorporate economists among others (Commission 2008). The expertise gap, so to speak, highlights a shortage in resources that would be helpful, if not required, were the rac s to evolve from advisory bodies to bodies playing a prominent and proactive role during decision-making and implementation. With some discussions of regionalisation suggesting that the rac s evolve into de facto managerial or decision-making entities, it is interesting to gauge how participants feel about their level of impact in their present advisory role. The survey asked respondents, ‘To what extent do you feel your organisation’s participation has impacted the decisions that change the course of fisheries management in the European Union?’ Some survey respondents did not represent an organisation and twelve of the 130 who responded to the question chose ‘Not applicable’. Of the remaining 118 responses, over half selected ‘Somewhat impacted’. Thirty-six per cent were less optimistic, replying ‘Impacted very little’ and seven per cent felt their efforts had ‘No impact at all’. Only three per cent thought that their rac participation had ‘Greatly impacted’ decisions. 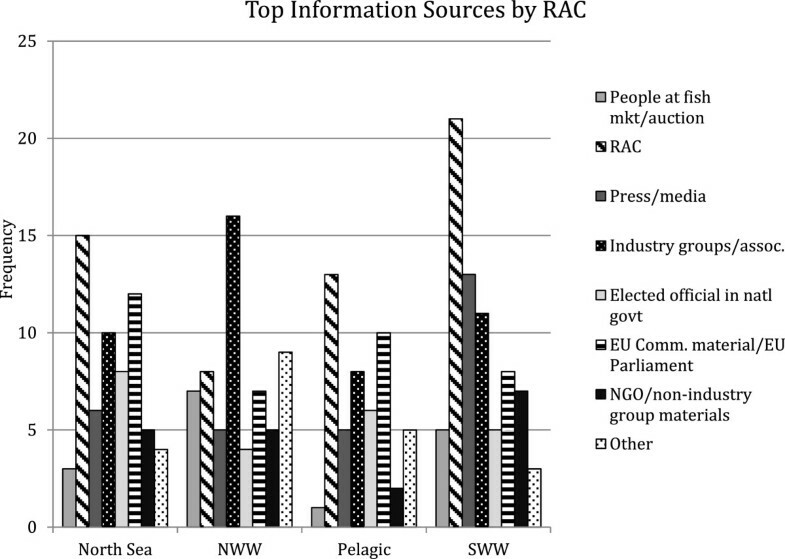 Figure 4 beneath divides the results of feelings of impact across rac s and suggests a modest split among rac s. A total of 53 per cent of the North Sea and nww rac participants find that their organisation’s participation in the rac ‘Impacted very little’ the course of fisheries management in the European Union. Pelagic respondents were less despondent, with only 26 per cent saying that their organisation has ‘Impacted very little’ to had ‘No impact at all’. The extent to which survey respondents felt their organisation’s participation in the rac impacted the decisions that change the course of fisheries management in the eu (N = 130. 12 responses of ‘Not applicable’ not included in graphs). It is difficult to draw conclusions from these results alone. The interpretation of the feelings of impact can be quite subjective depending on the perspective. Those coming from the ‘glass is half full’ paradigm would cite that over half the respondents feels that they make a moderate to high impact; the more sceptical or cynical might be surprised to see that the rac s have in some way made stakeholders feel that they are better heard. On the other hand, an equally large share of participants do not feel that their role in these advice forums has much impact on the policy outcomes—a major tenet of the introduction of the rac s. We can probably best employ these results as a baseline to compare as the rac s continue their work or as their roles transform in the context of new governance arrangements. Similarly to the quantitative data, comments from the survey provide these two different perspectives on impact. On the more hopeful side, one participant notes, ‘I do not think that the rac s’ have had as great an impact as they should have had. Hopefully this will change in the near future’ (Survey participant 101). Some do not put as much emphasis on the rac s, but see it more as one piece in a larger operation to improve fisheries management in Europe, ‘It is not a principal influencing mechanism but important mechanism for improved understanding between Member States and rac s and helpful to input into policy development’ (Survey participant 105). Of course, there are a number on the other side who feel frustrated by what they consider lack of attention by the Commission, as one Industry person responds, ‘Not for lack of trying. I attend rac meetings to put the views of fishermen to the Commission. I may as well stay at home but I take the opportunity’ (Survey participant 110). Many participants felt that the Commission does little in the way to support rac recommendations and either ignores or goes on with previously outlined plans. Thus, while these results should be compared to subsequent findings on this topic, it would seem that the Commission does have room to grow in its attention to stakeholders to improve both process and content legitimacy. Through two questions the survey investigated how the RAC participants felt that participation in the rac had changed the relationship between different groups when it comes to trust and understanding. Overall, ‘Trust’ in industry, non-industry, and Commission range from no change to increase; none of the means indicate a decrease in trust due to participation in the rac (Table 5). The means for levels of change in ‘Understanding’ trend toward the increase end of the spectrum in comparison to the trust responses, which aligns with the plausible hypothesis that understanding of different stakeholder priorities, is easier to achieve than trust in those parties (Table 5). (Table shows means. N = 122. The survey asked, ‘Please score the degree to which your level of trust/understanding in the following groups has increased or decreased due to your participation in the rac.’ 1 equals ‘Greatly increased’ and 5 equals ‘Greatly decreased’). For the full survey population, the increase in trust in industry stakeholders ranks significantly higher than the increase of trust in Commission representatives and non-industry stakeholders. However, in the case of industry versus non-industry stakeholders, the large representation of industry members among survey respondents likely affects the outcome on this measure. Notably, few participants feel that their level of trust or understanding decreased through participation in the rac, but interestingly the Commission is not as insulated. A little more than 30 per cent of Industry participants feel their trust in the Commission has decreased and a little more than 20 per cent of those in the Conservation category feel the same way. Nevertheless, the overall trend of these measures reveals that communicating and working together in the rac s is associated with heighted feelings of connection across stakeholder type (Figure 5). 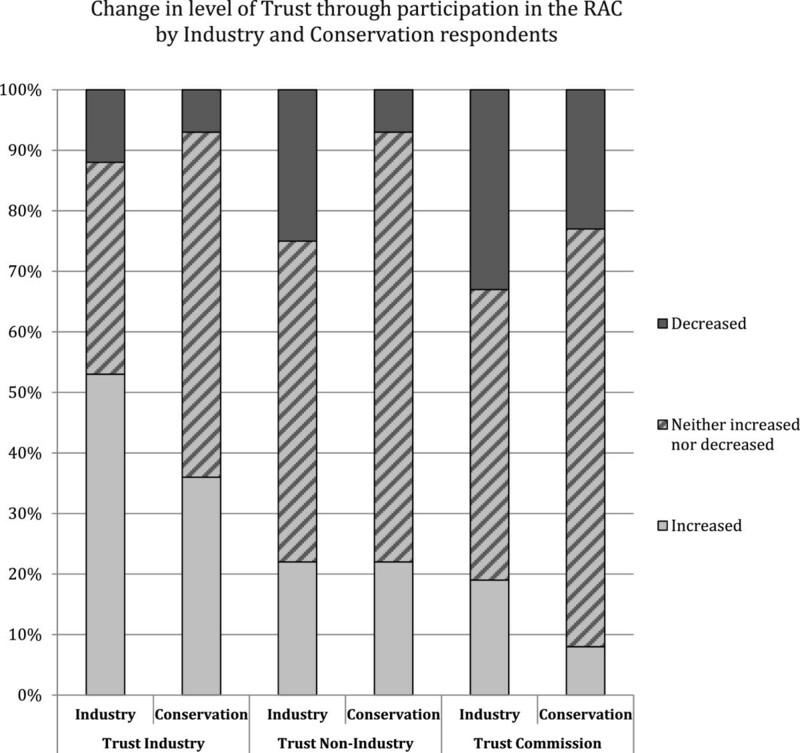 Changes in level of trust through participation on the RAC by industry and conservation respondents (N = 58 ( Industry ), N = 14 ( Conservation ). Reading guide: The first two bars from the left show the development of ‘trust in industry’ reported by respectively Industry and Conservation respondents. As an example, approximately 12 per cent of Industry respondents report that their trust in other industry actors has decreased by participating in the rac. The third and fourth bars show the development of ‘trust in non-industry’; the fifth and sixth show the development of ‘trust in Commission’). Participant comments echo the overall lower levels of positive change in levels of understanding and trust for the Commission. There is some scepticism toward the sincerity of the Commission’s interest in the industry perspective and questions as to whether the Commission understands the impact of its decisions. A respondent elucidates as such, ‘Regarding the eu, generally the representation is good and balanced although at times there seems to be almost a sense of giving lip-service to the industry and using the rac as a tick box exercise to say they have consulted extensively with industry’ (Survey participant 65). In terms of Industry respondents indicating that they experience increased levels of trust in fellow industry members, it seems as though interactions on the rac between industries from other member states have led to better understanding and subsequently heightened trust within the group. Nevertheless, Industry as well as Conservation and participants from other categories indicate that they detect that some rac participants are more forthcoming than others, ‘I think some of the industry and non-industry stakeholders are much more open and transparent than others. Some still seem to forget the purpose of the rac at times and pursue their own interests, over and above the interests of all the rac members’ (Survey participant 65). Numerous participants underscore the developing relationship between environmental ngo s and industry representatives, but some remain concerned that strong economic interests of industry cloud other objectives that are valued by ngo s and other rac participants. On the flip side, some industry members note frustration with the strong attention paid to certain conservation agendas by environmental ngo representatives. The ubiquity of the ‘industry versus non-industry’ theme contributes to its reputation for being somewhat trite. Nonetheless, one respondent provided a rather colourful analogy for the working relationship between the two factions, ‘Between the ngo s and the industry, it’s not so much a matter of trust from my viewpoint but rather like an arranged marriage, where you don’t choose each other as bedfellows, but rub along for the benefit of the progeny (=policy outputs). We rub along and understand each other better than pre-rac’ (Survey participant 64). To continue with the metaphor, while there is a developing relationship, it seems as though we can stop short of describing it as marital bliss. Means for three statistically different challenges among rac s (N = 31 (North Sea), 31 (NWW), 23 (Pelagic), 34 (SWW). (1 equals ‘Very Easy’ and 5 equals ‘Very Difficult’). ‘Reaching consensus’ is also the most frequently selected option for the challenge most critical to the rac’s success. In the case of the North Sea, ‘Reaching consensus’ is the second most frequently selected with one response less than ‘Cultivating better cooperation between industry and non-industry members’. Participants from the sww rac choose the consensus measure as the second highest priority to ‘Balancing small-scale versus large-scale fishing priorities’. Building on the themes of trust in the previous section, one respondent tied together the importance of consensus and the challenge that lack of trust and understanding presents to this goal:One of the major challenges for the rac s (and a key driver for its success) is the need to build trust among members: it is necessary that rac s are not seen as a lobby organisation but a forum to provide advice on fisheries management measures for some particular fishing areas through sound evidence-based advice. In practice, consensus is difficult to achieve (especially when talking about reconciling biological and socio-economic objectives) because some members still put their own interests before the achievement of common goals (Survey participant 75). The rac s significantly differ on the measure of ‘Addressing different national catching sector priorities,’ which in turn is most pronounced in the division between the nww and North Sea.s The North Sea rac participants view this challenge as significantly easier than participants in the nww, sww, and Pelagic rac s. By contrast, the nww rac grapples with this challenge more than the other rac s. The Pelagic and sww rac s fall between the North Sea and nww rac s and closely to one another with averages of 3.32 and 3.27 respectively. Figure 7 beneath shows the frequency distribution for the answers selected for this challenge grouped by each of the four surveyed rac s.
Frequency distribution of the level of difficulty associated with ‘Addressing different national catching sector priorities’ for each rac (N = 117. The raw number of participants is displayed in a pie graph to illustrate the differences in distribution especially for the North Sea and North Western Watersrac s). 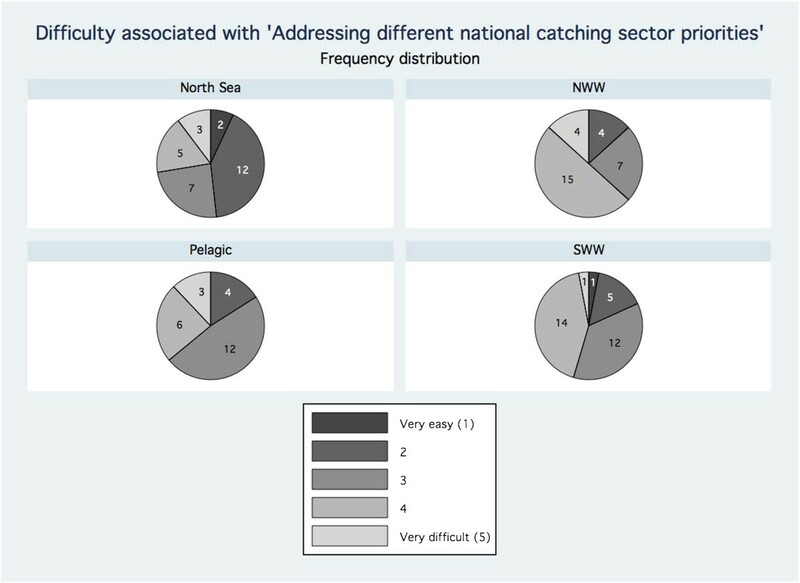 Nearly two-thirds of the nww respondents rank ‘Addressing different national catching sector priorities’ as somewhat difficult (score 4) to ‘Very difficult’ (score 5), whereas less than one-third of the North Sea respondents rate the challenge as such. Of the Pelagic rac survey participants, nearly half regard the challenge as neutral. Furthermore, 48 per cent of the North Sea rac respondents find the challenge somewhat easy (score 2) to ‘Very easy’ (score 1). Within the three other rac s, nww, Pelagic, and sww, respondents selecting those same categories amount to shares between 13 and 18 per cent. Additionally, four North Sea rac respondents find this challenge to be ‘not applicable’, which is not reflected in the averages and the answer tabulations as aforementioned; by contrast none of the nww participants believe this challenge is not relevant. One nww participant observes, ‘As an outsider looking in I would say the nww rac at times seems to struggle to reach a consensus with some countries almost vetoing others’ (Survey participant 45) underscoring the findings on this question. Although we cannot say with certainty why this measure likely does not score high on difficulty for the North Sea, the relative similarity of national fleet structures in the North Sea countries may be a contributing factor. There is a division between rac s on the difficulty of ‘Responding to specific advice requests (“firefighting”)’.t Both the North Sea and nww rac s experience greater difficulty with this challenge as indicated by means 3.38 and 3.45 respectively, compared to the Pelagic and sww rac s, as they average to slightly below neutral with 2.95 and 2.91 respectively. We speculate that this divide is due to the precarious situation of several stocks in the North Sea and to a lesser extent in other waters, which has led to more demands on providing advice to specific requests, often referred to as ‘firefighting’ as compared to the two remaining rac s. However, few participants from each of the rac s selected this challenge as the most critical, highlighting that in any case it is not one of the most salient issues to rac participants. Nonetheless, some respondents do see the need to tackle emerging problems as a hindrance to the long-term development, ‘The rac’s firefight most of the time leaving very little opportunity to create and deliver higher, longer term strategies. This is one of the glaring weaknesses’ (Survey participant 102). While not statistically different among the rac s, the North Sea rac provides an interesting illustration of the struggle with ‘Cultivating better cooperation between industry and non-industry interests’. For this rac, ‘Cultivating better cooperation’ in relation to some of the other challenges there is no statistical difference. However, 12 of the 35 North Sea respondents rank the relationship between industry and non-industry members as the challenge most critical to the rac’s success. The proximity of the consensus and industry/non-industry means and the priority placed on them indicates that the North Sea rac struggles with these two challenges, but also sees them as integral to its success. The results from ‘Balancing small-scale vs. large-scale fishing priorities’ reveal an interesting division between participants from southern and northern Europe. Among the rac s, the sww stands apart from the other three, but there is not a significant difference in the variance when divided by rac. Nevertheless, 66 per cent of the sww respondents rank the measure somewhat difficult (score 4) to ‘Very difficult’ (score 5) while in the other rac s such answers comprise only 45 per cent of responses. In addition to the difficulty mean of 3.77, a quarter of the sww participants select this challenge as the most critical to the rac’s success. Notwithstanding, geographic affiliation highlights a starker contrast for the difficulty associated with the proposed obstacle and is statistically significant.u Thirty-two per cent of the survey participants from the North rate this challenge as difficult compared to 66 per cent of participants from the South. Furthermore, more than a quarter of the participants from the South believe the issue of balancing scale is the most critical to the rac’s success while none of the participants from the North considered this as the most important challenge. One uk participant commented that small-scale fisheries had no bearing on rac processes because such fisheries fell under national jurisdiction. By contrast, one Spanish participant noted the struggle for balance, ‘Being a rac [sww] in which the critical mass is mostly small-scale fisheries, the control of the presidency and secretariat is held by the industrial fisheries’ (Survey participant 60 translated from Spanish). These results highlight one of the more pronounced cleavages between northern and southern perspectives that we found. There is no significant association between the choice of most critical challenge and the rac membership; however, the North–south division proved a strong relationship. The North Sea, nww, and the Pelagic rac participants all rank the consensus measure and the cooperation between industry and non-industry members as the first or second most critical challenge to the rac’s success at a share of about 30 per cent within each rac. While sww participants recognise reaching consensus as a critical challenge, 25 per cent from this rac selects balancing small- versus large-scale priorities, the highest proportion of the sww responses. There is significant associationv between geographic affiliation and most critical challenge chosen. The participants from the North category focus more on consensus and cooperation between industry and non-industry members. None of the participants from the North category view scale as the most critical issue. On the other hand, those from the South category make up 82 per cent of those selecting small- versus large-scale as the top issue.w ‘Reaching consensus’ and ‘Addressing different national catching sector priorities’ also rank highly for those from the South category, 10 of 52 and 9 of 52 respectively. ‘Communicating in different languages and across cultures’ was included to measure if rac s with more diverse composition of countries, such as the nww rac struggle more than a rac that is able to communicate almost entirely in one language, such as English in the North Sea rac. Unlike the other five challenges, the means for communication measure within each rac range from neutral to relative ease. Moreover, there is little difference in the frequency distribution of answers along North–south lines. Surprisingly, communicating in different languages and across cultures does not seem to pose a major challenge in the perception of participants for any of the rac s.
There has been some criticism of the rac s established in the 2002 cfp reform based on the perception that they did not go far enough to engage stakeholders in decision making (Gray and Hatchard 2003). This article aimed to probe the operations of the rac s further than the discourse analysed in previous work and identify how meeting participants rate these advisory forums. Based on our study, in some ways the rac s can be seen as representing an interim institutional stage, facilitating better information sharing, and cultivating stakeholder relationships. Displayed through the motivations of many interest group participants, people do come to the rac primarily to improve stakeholder input to the Commission and represent the interests and constituencies of their organisations, but notably also to interact with fellow stakeholders. The interest in networking with others is further pronounced in the marked trend toward using the rac as a primary purveyor of information, both in its written communications and—though to a lesser extent—its membership. Moreover, few participants feel as though their level of trust and understanding of other stakeholder groups decreased because of rac interactions. Consequently, the rac s possess an additional—often not sufficiently recognised—role and value to the advice sent to the Commission in that they facilitate understanding across and within sectors and interest groups. However, it should raise some concern that the Commission representatives score low on this measure. To some extent it looks like rac participation of both Conservation and Industry respondents has resulted in decreased levels of trust in and understanding of the Commission, which to some extent is not seen as responsive towards the rac s.
Although communication appears to be an insignificant challenge to many of the rac s, they are nevertheless challenged to find consensus and navigate the different priorities of the membership either in terms of national designations or industry versus non-industry groups. In addition, each rac or region must address particular needs, which in turn necessitate solutions that afford the opportunity to tailor policy to certain regional conditions. In relation to this, the resources available to the rac s are lacking in terms of the scientific knowledge and expertise available to respond to specific advice requests. The respondents especially perceive economic and social science expertise as being unavailable in their work within the rac, something that might be a greater problem if the rac s are to take on greater responsibilities in the future. When gathering the empirical material for this article commenced, the 2012 reform had only just begun with different stakeholders postulating on where the Commission would come down on regionalisation and possible co-management with many trying to affect change by submitting comments to the 2009 Green Paper. At that point it was a bit easier to behave as a Pollyannax when viewing the rac s and the cfp. However, with the release of the Commission proposal in July 2011 (Commission 2011), the dark clouds may have propagated over this sunny institutional evolution outlook. From the findings of this research, it appears that the rac s are contributing positively to the cfp, but are likely approaching a critical juncture where resources and some indication of confidence or acknowledgement of their efforts would at least sustain if not propel these forums forward. Nevertheless, mention of the rac s and innovative consideration of their role within the upcoming reformed cfp is curiously absent from the Commission’s proposal apart from removing the term ‘Regional’ from their titles as a cosmetic adjustment for the likes of the Pelagic and Long Distance entities, as well as the creation of an Advisory Council devoted to the issue of Aquaculture (Commission 2011). Rather, the Commission has set its sights on rationalizing eu fisheries. There is no means of knowing how such a management scheme would affect the existing role of the rac s, but certainly it does not seem to address the problem of legitimacy, which has rolled over from the previous reform (Raakjær 2009). Evident from the literature and from the opinions garnered in the survey, participants will continue to engage in good faith, but there will come a point when many will question the degree of advice uptake into the decisions. Some research even warns that a prolonged pattern of no perceptible influence on policy decisions will alienate participants even more than no provision of a participation mechanism (Halvorsen 2003). If the Commission assumes that engagement with stakeholders is fine as it is, making no effort to improve for instance the problem of availability of expertise, then they indeed risk alienating those giving their time and effort to rac working groups and Executive Committees. Without support to these bodies the murmurs accusing the Commission of only paying lip service to stakeholder participation as a public relations exercise will likely grow louder with ramifications for conservation outcomes. aFor a discussion of process and content legitimacy, please refer to Hegland et al. (2012a). bSome participants opted not to answer particular questions. Thus, most questions total less than 138 responses. cThe survey comprises three sections: Background, Current rac Functioning and Capacity, and finally Reform of the Common Fisheries Policy and Regionalisation, of which the first two sections are covered in this article. The findings related to the final section of the survey appear in Hegland et al. (2012b)in this special issue. dIn the web survey participants were required to choose one of the four rac s; however, two persons responding to the paper version did not choose a primary rac. eWhereas women in fishing and regional development interests in the context of the rac s are often associated with the commercial fishing industry, this is generally not the case for recreational fishing interests. These interests—at European level predominantly represented by the European Anglers’ Alliance (eaa)—often find themselves in opposition to the commercial industry. However, at the same time it would not be reasonable to group these representatives within the Conservation category, since they do represent an interest and an industry that base activities predominantly on the extraction of fisheries resources. fAlthough Poland is aneu member state, unlike Norway or the Faroe Islands, it was included in the Other group because it did not fit into the North–south dichotomy. gParticipants who categorise themselves as a non-interest organisation (i.e. member state representatives, scientists, eu Commission representatives) felt some of the questions in the series were not applicable, which was somewhat expected for these groups. Those opting for not applicable on the motivations measures total to less than ten and are evenly dispersed throughout the different participant types. However, on the motivation measure stating, ‘Serve those I represent in my organisation,’ fourteen of 135 participants chose ‘not applicable’, many of which fell into the Science/Research, eu Commission, and Other categories. h t(117) = 4.44, p < 0.001.
i t(59) = 2.72, p = 0.004.
j t(77) = 13.27, p < 0.001.
k t(27) = 13.80, p < 0.001.
lTechnical fisheries knowledge relates to matters roughly associated with gear and vessel types. Practical fisheries knowledge is mostly gained from day-to-day operations from those who work regularly on the water or in onshore fishing related industries. While the survey intended to capture any difference in the level of availability of experiential fisheries knowledge through the ‘practical fisheries knowledge’ measure, it is likely that many respondents did not detect the nuance in our employment of ‘technical’ versus ‘practical’ wording. mOne sample mean-comparison tests show three rac s below the ‘neutral’ mean of 3: North Sea t(33) = −3.58, p = 0.001; nww t(31) = −4.29, p = 0.001; sww t(34) = −3.18, p = 0.003. The Pelagic rac is statistically closer to neutral. nFor social science expertise one sample mean-comparison test gave the following results: North Sea t(32) = −6.47, p = 0.001; nww t(31) = −6.37, p = 0.001; Pelagic t(23) = −2.46, p = 0.02; sww t(35) = −3.66, p = 0.01.
oAnalysis of Variance (anova) statistical test revealed the difference among the four rac s F(3, 121) = 4.10, p = 0.01. Furthermore, 42 per cent of Pelagic respondents chose 4 or 5 (‘Always available’) whereas 15 per cent or fewer chose the same response in the other three rac s for economic expertise. pThe anova statistical test revealed the difference among the four rac s F(3, 121) = 3.76, p = 0.02.
qAn anova provides basis for statistical difference among four rac s on Consensus measure with F(3, 120) = 2.40, p = 0.07.
rThe difference in means between ‘Reaching consensus’ (4.00) and ‘Addressing different national catching sector priorities’ (3.63), the second highest mean, was statistically significant at p = 0.10, whereas all other measures were statistically different from consensus at levels of less than 0.05.
s anova F(3, 113) = 3.54, p = 0.02.
t anova F(3, 112) = 2.75, p = 0.05.
uComparing responses by geographic affiliation reveals a significant difference between those from the North and South on anova with F(2, 114) = 7.34, p = 0.001.
wThe Other category of geographic affiliation drew the remaining 18 per cent. xA ‘Pollyanna’ is defined as one who is overly optimistic (New Oxford American Dictionary). This article has been written in connection with the Making the European Fisheries Ecosystem Plan Operational project (MEFEPO, project website: http://www.liv.ac.uk/mefepo), which have received financial support from the Commission through the Seventh Framework Programme (FP7). The present article does not necessarily reflect the Commission’s views and in no way anticipates its future policy.